New Delhi :(19/03/2019) Delhi BJP stated today that it would complain to the Election Commission that the Aam Aadmi Party was violating the model code of conduct by trying to incite communal tensions. 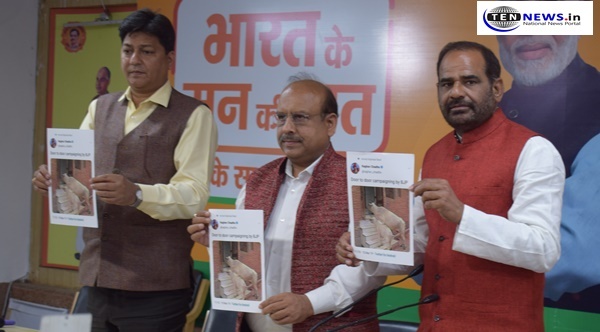 Delhi Assembly’s Opposition leader Vijender Gupta said AAP’s Lok Sabha candidate Raghav Chadha tweeted images of a cow and its calf standing at a doorstep and wrote ‘Door to door campaigning by BJP’ which was liked by Delhi Chief minister Arvind Kejriwal. “We have taken an appointment with the Election Commission of India and will apprise them about how the AAP is politicising cow which is a symbol of harmony and trying to create communal tension,” he told reporters. BJP MP Ramesh Bidhuri said complaints have been filed at the Govindpuri, Pul Prahladpur and Sangam Vihar police station against the AAP for trying to incite communal tension through Chadha’s tweets. “We will urge the Election Commission of India to invalidate the AAP and urge them to ensure that FIRs are filed on these complaints,” he added. Gupta also accused AAP of making phone calls to voters telling them their names had been deleted form the voter lists and creating panic among them. “They are taking PWD officials to the people and using them to tell people that this work has been done which is a violation of the model code of conduct,” he alleged.